I know this chicken dish looks and tastes ultra creamy and rich but it really isn’t . There’s just a cup of yoghurt in it and the rest is herbs and spices. Often when I don’t have much time I use the chicken tenderloins or fillets that I have used in this recipe. They take 5 or 6 minutes to cook through and that is what I love about them. They also don’t get as dry as breast fillet. There was all kinds of high jinxes going on out our house this week. 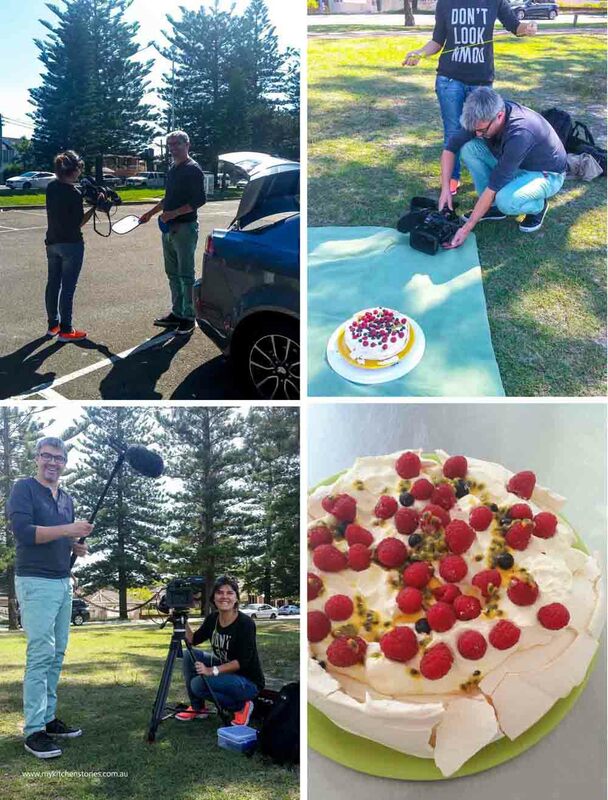 Lots of extra work and a bizarre day where a French film crew came to our house to film me making Pavlova. Why?. Well apparently they were filming all kinds of national dishes in various places around the world and a Pavlova was chosen from Australia. Yes, I know New Zealanders….. there was a lot of chatter about who actually invented the Pavlova but in light of THIS research, I think it is ok.
We live in an old tumbling down house and I felt a bit anxious about a film crew here so we set about fixing all sorts of little things that might make our house look a little less like a university frat house. That done the only worry was our oven turns it self off all the time. No, really it does believe it or not. I made a Pavlova before they arrived not only because the oven may have gone off without the possibility of it being re-lit but also because it makes sense to have a cooled down meringue shell ready to decorate. Pavlova may be Australasian but we don’t really have them very often in our house. I know that most other people do, but Skater doesn’t like fruit so we normally have something chocolatey. That said it is without doubt one of the most popular desserts at family celebrations here in Australia, so we made believe it was in ours to. Hopefully I can show you the film clip one of these days. The film crew were so unassuming and friendly and they felt like old friends. Maybe that’s the secret to them being a good film crew. After all the fun and games it is time for dinner. 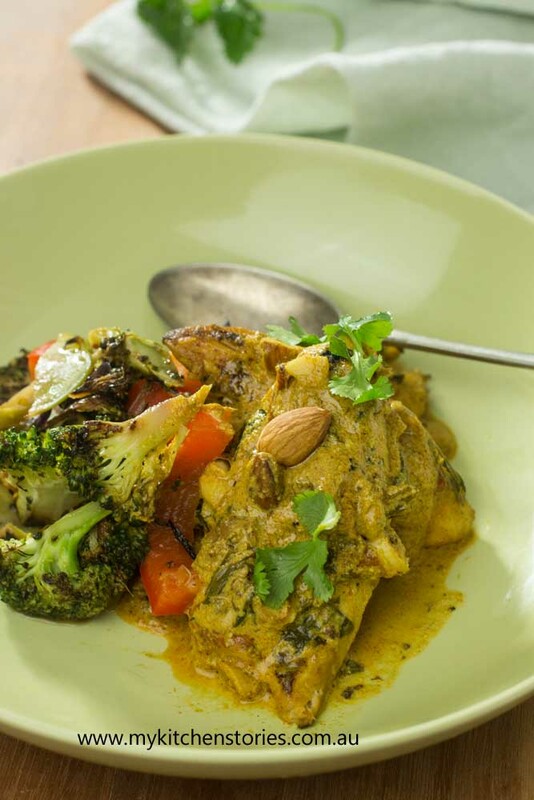 There’s nothing better than a dinner that not only has loads of flavour but is fast too. We ate it with some rice and a loved charred broccoli salad just because that’s what we had in the fridge . Made with the chicken tenderloins this is a quick dish. You could use thickly sliced breast fillet or even lean pork. I used a cup of very well drained plain yoghurt. Drape a tea towel over a colander and put 1 1/2 cups of yoghurt into it and drain while you prepare the resst of the ingredients. This isn't compulsory. Serve it with rice. Put the Marinade ingredients into a blender ( best) or chop finely and put into a food processor and puree till smooth. If it is too thick to puree add a bit of the stock to thin slightly. Heat a large frypan till hot. Add the oil and then the chicken fillets one by one. Fry till browned on the underside ( 3-4 minutes). Turn over and fry for 1-2 minutes before adding 1/2 the salt and the stock. Simmer for 2-3 minutes before adding the rest of the yoghurt and lemon juice. Cook till the sauce is nice and hot but don't boil furiously. Stir together well. Taste for salt and add more if needed. I also like to add a bit more lemon. The chicken cooks very fast. Mint leaves are also nice to serve with this. we also had a charred broccoli salad but any greens such as steamed spinach or bok choy would be nice too. Never use left over chicken marinade unless it has been cooked. If using it must be boiled well first. Otherwise set aside. Yoghurt will split when boiled. If it is drained of some of the whey it is less likely to look split. The appearance doesn't change the flavour at all, but if your sauce splits stir in a little more yoghurt at the end to make it nice and creamy. 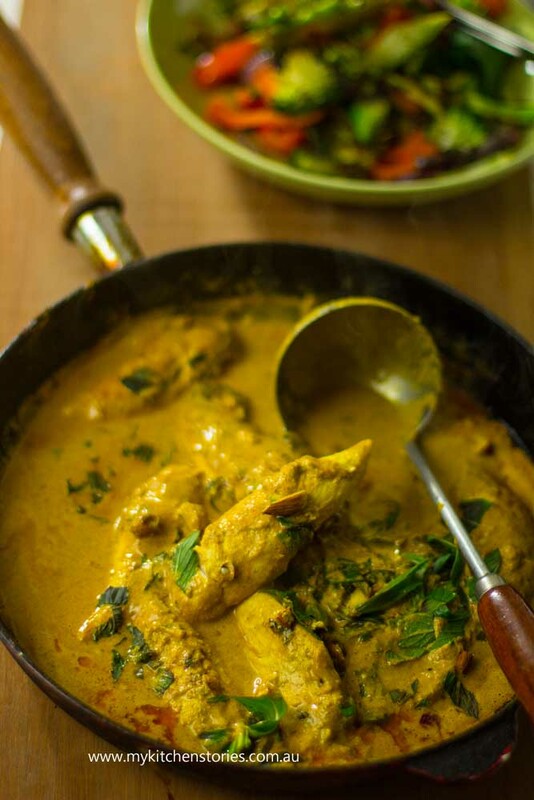 Yoghurt, chicken and spices, they go so well together! Hi Liz. They do indeedy. I wish I could have a slice of that glorious Pavlova!! Chicken tenders prepared this way must be extremely juicy and moist. Yum! 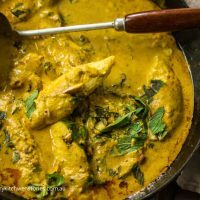 This looks delicious – we make something very similar in the Thermomix and I love the yoghurt sauce, it’s much lighter than heavier based cream dishes like Butter Chicken. Your pavlova looks pav-tastic, I can’t wait to see the clip. Is there such a thing as a food oscar?! Wow, how exciting having a film crew in your house! Both your pav and the chicken look fantastic. I love the idea of leaving the meat to marinate before you cook it! I usually make curry and then let it sit until the following day. But marinating the chicken before means I can have marinated chicken in the freezer ready to go. great idea!!!! This recipe looks super delicious! 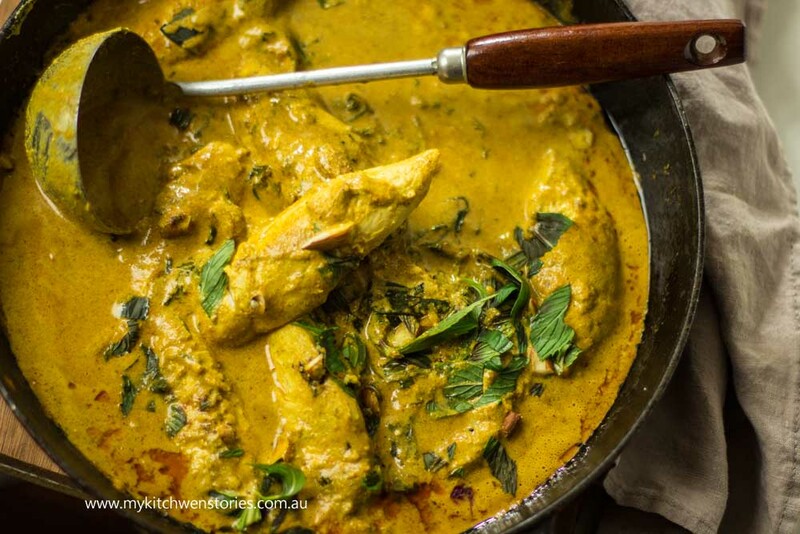 I love a nice creamy curry especially when it uses yoghurt not cream! It’s so funny, whenever the Pav is mentioned I think all Australians cringe waiting for a New Zealand to claim the dessert for their country of origin! Thanks Julie. It always feels more vertuous to eat yoghurt anyway! I haven’t made a pav in ages as my oven has become a little less than reliable and has developed horrid hot spots. However, this delicious chicken dish wouldn’t be a problem at all and I just know the troops will love it. This looks very yum. I have never tried a yoghurt chicken but I have heard good things.